Here's a picture book to delight those of us who dream of adventure. 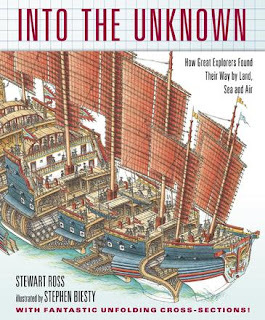 Into the Unknown was written by Stewart Ross, illustrated by Stephen Biesty and published by Walker Books (2011). A fascinating in-depth look at how great explorers found their way by land, sea and air, the book starts with Pythaeas the Greek (340 BC) and ends with Apollo 11 landing on the moon (1969 AD). 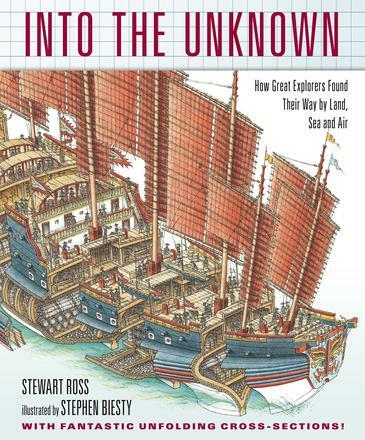 Join acclaimed illustrator Stephen Biesty and popular children's history writer Stewart Ross, as they themselves explore some of the boldest, most daring expeditions of all time, using fold-out pages, cross-section drawings and dramatic storytelling. Twist through the waves of the stormy North Atlantic in a Viking knarr with Leif Ericsson or burst into the stratosphere in a balloon with Auguste Piccard, cross the deserts of the Silk Road in a caravan with Marco Polo or land on the moon in the Apollo 11 lunar module... With this book, you can travel through time and space, in non-fiction that's as exciting as exploration itself! How could any of us, child or adult, fail to be intrigued? The problem with some non-fiction children's books is that they try to cram too much text onto a page. Others manage to kill children's interest in a subject by presenting information in a dry and dusty way. Into the Unknown is a prime example of non-fiction that DOESN'T do this. Text is spaced out and not at all didactic. Ross writes as if he's chatting with us, letting us in on fascinating glimpses of adventuring that he's gleaned from extensive research. He uses fiction techniques to bring the book alive. Biesty's illustrations are wonderfully detailed. They retain an old-fashioned flavour (in those parts of the book that deal with the past), yet are almost cartoonish in style - perfectly aimed at kids. Carefully unfolding the fold-out of Magellan's ship, The Trinidad, reveals a cross-section of the interior to us, complete with busy crew, and even one sailor falling overboard. Into the Unknown's creators have ensured that each element conforms to the book's vision. There are textured backgrounds to many pages - some have the look of cloth, others are grid paper or old maps. The choice of fonts and page dividers even add authenticity, and as for the maps … my fellow cartophiles, trust me when I tell you this is the book for you! I do try not to be gender biased in my book reviews - honestly though, my instant reaction was that Into the Unknown is such a boy book! It's definitely the sort of book my boys would have pored over and shared snippets from. However, I truly think it makes an excellent gift for the whole family. Into the Unknown is also a superb choice for teachers and parents who want to develop visual literacy in children, and show them how information can be organised and displayed in many different visual ways. Find more Children's Book Reviews on The Book Chook via Reviews.